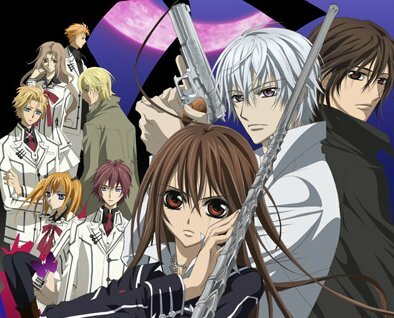 Vampire Knight follows a young girl by the name of Yuki Cross who is guardian between the Day Class and Night Class at Cross Academy. What the Day Class doesn’t know is that the Night Class is full of vampires who want to bring peace between the humans and vampires. However, Yuki can’t remember anything before ten years ago and the first memory she has is being attacked by a vampire, and saved by the vampire Kaname. She struggles to find out her past, meanwhile the present peaceful times are being disrupted by vampires, humans, and hunters alike. Little does Yuki know that things that happened in the past may want to stay forgotten. I love this show, as I have binge watched it many times… The artwork, although sometimes not as smooth as it could be, is very beautiful. The voice actors did a wonderful job bringing the characters to life, and I especially like the voice for Kaname (Yes I am team Kaname, get over it). The story itself is very similar to the manga (which I will be reviewing later) and I’m very thankful for that (unlike Black Butler…) and I really wished they kept this series going. There is still a lot that isn’t answered, and from reading the manga (almost done) the history of the vampires is a lot deeper than they provided in the show. The story itself, I wish we got to see more interaction with the Headmaster, as he reminds me of Vash the Stampede, with being rather crazy then all of a sudden serious. I also wish Yuki was a little less naive at times, although it made sense given her actual past (I won’t give spoilers). All in all, if you haven’t seen this series and love vampires and romance, this is for you! 5/5! Oh man that was an entertaining anime to watch back in the day. Not one of my favs, but a good shoujo one for new people. Yeah I think it is a great start as well! It was one of my first animes in college that got me into anime.